Let's begin by saying that Fr. Groeschel is an amazing man. He has many followers, my mom included, and I first heard about him through the S.C.R.C. Catholic conference. I am disappointed to say though, that this book was not for me. Even at being only 159 pages, I did not make it through the entire book. This being said, I am sure many people would enjoy, and could learn and grow from this book. The back cover of the book does justice to what the book is, "Fr. 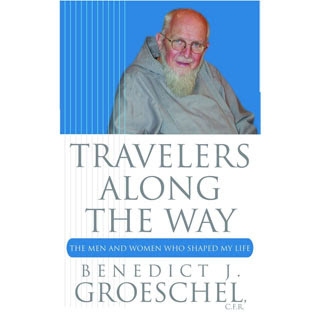 Benedict Groeschel introduces you to the men and women who have influenced him over the course of his life." But for me, the stories were not intriguing and were a bit lackluster. I did not feel drawn into the stories. Even as the back of the book states, "Some are unknown, such as Mr. Graff, a Jewish man who tailored the suit the young Groeschel would wear to the seminary: 'Look, I don't understand about monasteries, but I'll give you a piece of advice. Be a good boy." That was the highpoint of that story. It was a 4 page story that ended with him never seeing the man again and about how he will follow that advice. The premise of the book is a good idea and it is awesome that a man such as this would let us into life and show us how he was shaped. I am sure that Fr. Groeschel fans would appreciate this book and I know that others can draw inspiration from the book, especially those who are interested in the priesthood or following God's will. This review was written as part of the Catholic book reviewer program from The Catholic Company. The Catholic Company is also a great source for serenity prayer and baptism gifts. You can find all active reviews of this book here. Visit the Catholic Company to find out more information about Travelers Along the Way.